Police are on the look out for a red truck that was stolen Tuesday evening. 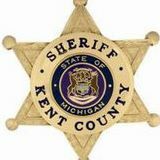 The Kent County Sheriff’s Department-Cedar Springs Unit was dispatched at 6:58 p.m., on Tuesday, February 24, to the Tractor Supply Company on 17 Mile Rd regarding a stolen vehicle. It was reported that a 2001 Ford F350, Dark Red 4×4, with a black stripe near the bottom, chrome running boards and clearance lights on the truck cab, along with a snowmobile trailer and four sleds, were stolen from the parking lot while the owner was inside. The keys were with the vehicle. On the morning of February 25, the trailer and contents were recovered near Howard City at the M-82 park and ride. The truck is still outstanding. Kent County Sheriff Department Scientific Support Unit responded to the park and ride to process the trailer. Anyone with information is asked to contact Silent Observer at (616) 774-2345 or the Kent County Sheriff’s Department.